So many times we order pizza from these big brands and it is an easy thing to do. However, making pizza at home is equally easy although it requires a little preparation beforehand. If you have your pizza dough and pizza sauce prepared and frozen, even that possibility is eliminated. This philosophy is inspired by Hubby Dearest and out recent trip to Venice where we saw the pizza being made from scratch in front of our eyes. Another chat with Mom and a little convincing by Hubby made me walk the path of pizza at home from scratch. It was not half as bad as I thought it to be. I did use tomato ketchup and chilli sauce instead of making my pizza sauce but you can go the extra mile in that department too. Here I am discussing how to make pizza dough. It will be enough to make 3 thin crust 10” pizza bases. Mix dry yeast, sugar and a little water in a container till the yeast dissolves. Add the salt and 2 cups flour and remaining water to mix well till the dough comes together. If it looks sticky, add more flour. Cover the container and let the dough rise for 2 hours. 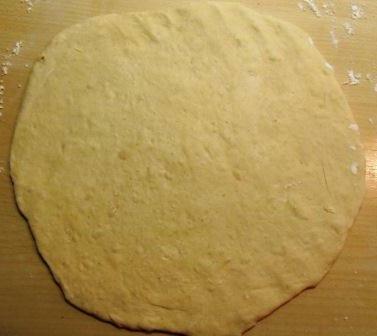 Once the dough has risen, take it out of the container and place it on a well dusted surface. Punch it to take out the air and knead it for 5 mins. If it is sticky, add more flour as required. 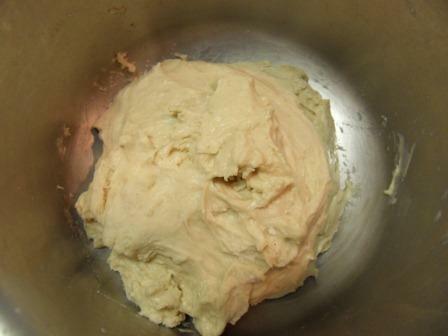 Place the dough in a well oiled container and spread some oil on the exposed surface of dough also. Cover it and place it in the fridge till further use. When ready to make pizza, take out the dough on a well dusted surface. Divide it into three equal sized balls. Roll each one into a circle about 10” in diameter. The base is ready. Assembling the pizza is the most fun part of the whole process. You can involve even children as they will enjoy making their own pizza. Pre-heat the oven for 5 mins at 200 C.
Oil the pizza tray well with oil. Place the pizza base on the tray. Spread the pizza sauce on the pizza base as evenly as possible. Sprinkle the veggies and the seasoning. Spread the mozzarella on top. Bake in the oven for 15-20 mins at 200 C till the cheese has melted and is golden brown. The crust should be cooked through and will be deep golden brown at the edges and soft in the middle. Cut the pizza into wedges and serve hot. Tip: You can vary the pizza deep dish by making the base thicker. You can also make a stuffed pizza by baking two bases separately for 5 mins and then placing them on top of the other with cheese or any stuffing of your choice in between. Well, there is a way you can make pizza without an oven. You can cook it like a chapati on your tawa. 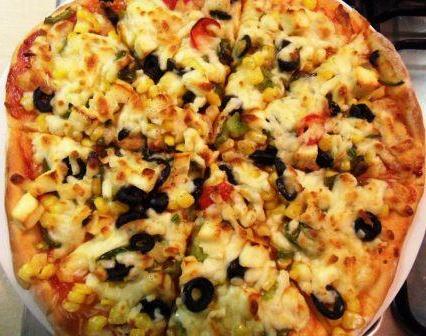 Once the dough is cooked, add the toppings and then cover it will the cheese melts. This will not give a top notch pizza and the cheese will not brown but you will get a pizza nevertheless. Baking a pizza in a cooker is a good idea. I am not sure if the cheese will get a brown color but you can definitely try and let me know how it turns out.